From watching British mystery shows such as Prime Suspect or Vera, you'd think all female police officers are disrespected by their male colleagues, and so bitter about it that they turn to the bottle and avoid personal relationships. Because of this, the delightful series Murder in Suburbia is a breath of fresh air. 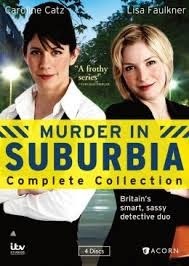 The two female officers, DI Kate Ashworth (Caroline Catz) and DS Emma Scribbins (Lisa Faulkner) are two young and glamorous detectives who investigate crimes while also trying to navigate the tricky world of dating. Their hunky boss, DCI Sullivan, is a welcome distraction from the daily grind, even if their detective skills can't help them learn much about his personal life. Episode one begins with the discovery of a woman who has been murdered in her own home. The victim, Nicola Pengelly, was stabbed to death. It turns out that she was a member of a singles club called Applejacks, even though she was engaged. She also has an ex-husband who is a shady car salesman. Still, "Ash" and "Scribbs" feel that the dating club is the key to the mystery, so they attend one of the club's social nights (dressed as schoolgirls) to see if they can learn anything. The owners of the club, Ralph and Maxine Appleby, also seem a bit shady. There's no shortage of suspects, but when another body turns up, the two detectives have to hurry and solve the mystery before the entire dating club is wiped out. In the second episode, a man is found dead at a private golf club. The club was hosting his bachelor party, and the prospective groom is found floating in the pool with his hands handcuffed behind him. He was last seen with the stripper hired to entertain the party guests, so she is the immediate suspect. While attempting to track her down, Kate and Emma find out that the mayor of Middleford wanted to sell off some of the club's land for personal gain -- a move that was vetoed by the dead man. While investigating, they discover that their boss, DCI Sullivan, is also a member of the club and is rather chummy with the mayor. Will his links to the golf club keep the truth from being exposed? The detective duo is called to Millionaire's Row to investigate a murder in episode three. The body of Gideon Finch is found in the front seat of his burned out car. The man's widow, Hannah, doesn't seem too upset about his death, since she's having an affair with his ne'er-do-well younger brother. Hannah tells the police that she suspects her deceased husband was carrying on with her married neighbor, Beth Whitmore. Beth, whose husband Phillip discovered the body while jogging, denies having an affair and further states that Gideon and Hannah weren't the right sort of people for their exclusive neighborhood. At the same time, Kate is dating a promising man, but her enthusiastic dinner table talk about the more gruesome aspects of her job seem to put him off. Emma, meanwhile, is on the lookout for an outfit to wear to an ex's wedding that will make him sorry he let her go. Too bad she only has Kate's closet to raid, since they don't exactly have the same taste in fashion. When a body is found outside a charity shop, it looks as though it was a random killing. However, it soon transpires that the victim, Lynn Chichester, was a volunteer at the shop. Things become even more strange when it transpires that Lynn and her husband, as well as the couple that ran the shop, were involved in a bit of wife-swapping with two other couples. Did jealousy cause someone to do her in? Or did she find out something she shouldn't have involving the shop? There's no shortage of suspects, and Emma is a bit distracted on the job as she tries to extricate herself from an affair with a married man. The cut-throat world of school admissions forms the backdrop for the events in episode 5. School secretary Helen McKee is walking along the sidewalk one evening when a car deliberately swerves to hit her. Everyone believes that Helen helped to decide which children got admitted to the school, especially if they had attractive fathers. The headmaster denies she had any influence on school admissions, but how else to explain how some children who didn't even live in the school's "catchment area" were admitted, while others were rejected? Some parents whose children were rejected are very bitter about Helen's involvement in the admissions process, so did one of them harbor enough resentment to do her in? Or was there something sinister in her private life? The final episode in season one concerns a man whose DIY projects apparently drive someone to murder. The man, Bernard Lloyd, is hated by everyone for his noisy building projects, but it's his wife Wendy (Mrs. Hughes from Downton Abbey!) who's found with a bloody hammer standing over his dead body. She says she can't remember what happened. Since so many people had a motive for wanting to quiet Bernard down, Kate and Emma have to wonder why he was killed at this precise time. Did someone have a new beef with him? Or did his long-lost son finally come back to exact revenge? Meanwhile, Kate is trying to sell her flat, but is dismayed when DCI Sullivan comes to look at it for his tall, blonde "friend" Brandi. Series two starts off on a bit of sinister note, when a local schoolgirl (who dabbled in witchcraft) is found dead in a cemetery. Holly Andrews not only created "hex dolls" of her enemies, she kept a coded diary which keeps Emma busy with a decyphering project. Holly was mean to other students, was involved in a love triangle with two other students, and seemed to have an inappropriate relationship with a teacher. Unfortunately, DCI Sullivan is away, so the detectives have to contend with his prickly replacement, Helen Whittle, who moves her desk into their office. It's also hard to concentrate on the job when Emma keeps unintentionally injuring her new boyfriend. No one really is in mourning when slimy estate agent Phil Jakes is found murdered in his office. Neither his co-workers nor clients have anything good to say about him. He was having a competition with his co-worker Anita to see who could sleep with the most clients. Could a disgruntled partner of one of their conquests have been the murderer? Plenty of clients feel that Jakes undervalued their properties to get quicker sales, so any of them might have a motive for murder. The day that he died, Jakes was telling everyone how he was coming into some money soon, and since he was so underhanded, everyone figures he must have been blackmailing someone. With so many possible killers, Kate and Emma have their hands full trying to find the guilty one. A wedding is the scene of a particularly tawdry murder in episode 3. A man is standing in an ornamental pond, drunkenly urinating during the reception after his daughter's wedding, when someone throws a live wire into the water. Again, the victim is so disliked that no one is really upset by his death. Still, Kate and Emma are determined to track down the killer. The happy couple, David and Nuala, have plenty of problems. David, a real mama's boy, works at the family business, even though his father is less than impressed by his abilities. Nuala is the lower-class waitress who attracted his attention, much to the disgust of David's snobby mother. Nuala's deceased father spent all his time at the pub. While looking over the dead man's flat, Emma is attacked by an intruder. To make matters worse, DCI Sullivan is tooling around the station parking lot in a sports car with a mystery woman. The world of salsa dancing heats up enough to kill local enthusiast Sandra Foy in episode 4. While dancing around her living room after a lesson, someone comes in and twirls her off her balcony. As usual, there are plenty of people that had reason to want Sandra dead. Her husband owns a travel business which is in financial trouble. Jez Hughes, who works at the salsa club, broke off with his long term dancing partner Felicity in order to enter a competition with Sandra. Roberto, the hunky Italian dancing instructor, has been having an affair with Sandra. He wanted her to leave her husband, but she refused. The same day Sandra died, someone threw paint over her car. Were the two incidents related? It turns out Kate and DCI Sullivan share an interest in salsa dancing . . .
Who knew dog walking would be so dangerous? Dog walker Christine Archer has no problem controlling the dogs, it's the people she can't deal with. While walking the dogs someone kills her with a blow to the head. Christine ran a kennel, and once again there are plenty of people who might have reason to want her dead. There's her shady business partner, Steve, "the dog whisperer" as well as the Eyshers, whose dog got pregnant while being looked after at the kennels. Christine's friend Estelle seems upset, but it is because her friend was murdered, or the fact that her dog Trixie has run away? The final episode in the series takes us to Birch Grove retirement home where Johnny Jones, who was a big star in the 1950s, is still entertaining the ladies. He lives at the home with his wife of 45 years, but she is growing tired of his philandering ways (after 45 years, you would, too!). When he's found drowned in the bath, it looks like death could have been from complications from his recent heart surgery -- except for the bruising around his ankles and the toupee stuffed in his mouth. Drugs are missing from the nursing home's office, so Kate and Emma decide to spend the night in the hopes of witnessing some dodgy behavior. Meanwhile, DCI Sullivan and Kate are doing surveillance when, to avoid being spotted by the criminal, Sullivan initiates a very passionate kiss. Is this the start of something exciting, or was he only acting in the line of duty? This set contains all 12 episodes from the two seasons of the series, which were originally broadcast in 2004-2005. I really enjoyed all of the mysteries and the interplay between the three main characters. The humorous touches made the series extremely enjoyable. I also thought the constant romantic entanglements of the two female leads made them seem more down-to-earth and likable. It's too bad the series ended after only two seasons, because it would have been interesting to see if the relationship between Kate and the boss went anywhere, or if Emma would manage to find a suitable boyfriend that she didn't injure. Disclaimer: I received a copy of Murder in Suburbia: Complete Collection from Acorn Media in exchange for this review.